This book is a true account of Gareth’s work with both lions and elephants in Africa. Firstly, thank you to Tracey Macdonald on sending me a review copy of this book, I do enjoy reading about people whose life work is to save and protect the animals. It is a worthy life cause and with so many people who either don’t care, don’t do anything, or worse, who even kill these animals for sport, it is an honour to know that there are people out there who care. I have to be honest and say that I did struggle a little to read this book due to his writing style, it was quite jagged and hopped about a bit but apart from that it was an interesting and heart rendering read. If any of you have read The Elephant Whisperer, it is in the same vein. 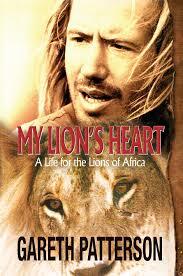 What intrigues me most about Gareth and his lion heart is that he literally became part of his lion pride. I think it would be awesome to have that sort of connection, both spiritual and physical, with a wild animal. I loved how he became part of them, how the lions knew that he was a part of the pride and showed him in ways that are just so special. What is the most heart rendering is that here are these men, who do everything in their power to help the animals, to try to make other humans see sense amid the senseless act of killing for sport and yet, the government does nothing and when it does,( it takes reels of paperwork) the people do nothing and the killing still continues. That just breaks my heart. And what breaks it even more, is that it still continues. We all know of Rhino poachers, but there are lion poachers and elephant poachers too. Sickening and Saddening. That in this day and age it Still occurs and for such bizarre reasons that it just cannot make any sense. I think that Gareth was called to work with animals, that he is spiritually connected to them and more specifically with lions and to read his account of his life was both awe inspiring and sorrowful. Do read it, I think the more people who are aware of the situation the better and maybe one of us will be inspired to do the same. You can find more about Gareth here and see the book trailer here. Keep an eye out for our interview with Gareth coming to The Book Club Blog soon!